“But we have this treasure in jars of clay to show that this all‐surpassing power is from God and not from us.” (2 Corinthians 4:7) Last Spring our family attended a funeral of a Christian friend and member of our church family who had gone home to be with Jesus. As we waited in the viewing line to share words of solace and hope with his family, our little Aaron Joseph, our son who was 3½ years old at the time, looked attentively at the gentleman lying still in the casket. On the way home, Traci and I were sharing with AJ and his sister, Bethany Hope, that this Christian man’s spirit was now with Jesus in heaven (2 Corinthians 5:1‐8). 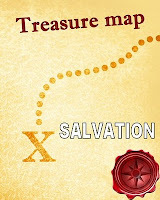 Aaron Joseph interjected amidst the discussion, “That man...in the ’treasure box’ ...he’s now Jesus’ treasure!” WOW! Our toddler son literally astonished my wife and I with the theological accuracy and Biblical perspective of his observation of death! Indeed we are each God’s loving, hand‐made treasure! Talk about being humbled by your children ... what a simple blessing of God’s truth as seen the eyes of a small child. Jesus tells us in His Holy Word, “Let the children come to Me. Don’t stop them! For the Kingdom of Heaven belongs to those who are like these children.” (Matthew 19:14, NLT) The simplicity of a child’s perspective is what so many often lose as we journey through this life. We complicate the Gospel and it’s power to transform lives and save souls by adding “religiosity” to our daily faith … following man‐made traditions / rules in lieu of living out the commandments from God (Mark 7:8‐9)! We must remember that as God’s people, we are to called to live supernatural lives and to share “His treasure placed inside these jars of clay (i.e. our bodies).” Have you found this kingdom treasure which is “immeasurably more than all we ask or imagine, according to His power that is at work within us?” (Ephesians 3:20) That treasure is a personal love relationship with Jesus Christ which is accompanied by His daily power which enables us to journey with Him through this life on our way to eternity in Heaven. Matthew 6:21 declares, “For where your treasure is, there your heart will be also.” (HCSB) Despite all the troubling headlines today, we can all have His PEACE in knowing that God’s richest treasure has been made available to ALL who would receive “His glorious riches in Christ Jesus!” (Philippians 4:19) ...Got TRUE treasure? If not, please drop us a note and we will be glad to share with you how you too can receive this wonderful treasure from heaven! …Selah! Today's Spirit-led CCM video is by Tree 63 and can be viewed by clicking on the on the praise & worship song title, "Treasure" (one of my favs' @ Journey 2427) - G3 for sharing His power-filled words thru CCM & Praise!